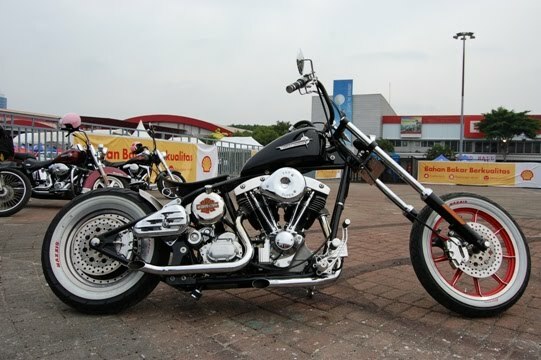 On an annual event, Indonesia International Motor Show (IIMS) 2009 is a user community chopper bike taking the time to attend on July 26, 2009. One of a row of motorcycles parked chopper near the test ride motorcycles and cars Proton Minerva, there are interesting. Yup .. sounded really poser really! Proved to be an HD Ownernya Mania. Bro Bowo Wirono that Gumbel Wero Chopper workshop is located at Jl. No.5 Teuku Umar, Menteng, Jakarta. "Incidentally, I'm just working on Harley-Davidson motorcycle. Want a custom like anything please if interested" as he said there are still five more HD in his shop. Based engine Shovelhead Harley Davidson V-Twin in 1976. Is one of the legendary engine that produced HD period 1966 to 1984, air cooled, with an angle of 45 degrees, a capacity of 1200 cc. Although HD is quite old but do not sangsikan performance, easy engine start-up and no trouble at all. Larinyapun reliable, capable of turing with HD motor dropout this year alone thanks to baru.Tentu cold hands of the owner. In fact a year ago in a motorcycle exactly what the conditions. But the itch is, the desire to be different was no power bro ditahan.Sehingga Bowo eventually bring nearly all parts of the motor mount attached to the land directly from Uncle Sam. Within about 6 months then be like this now. Assembled with patience and of course with the heart. Deliberately chosen a round rubber tires Maxxis Classic type with a white wall. Remember, this is not already inherent tempelan.Namun from the manufacturer. The selection of this circular rubber impression is of course a classic. The bow of the dimension 100/90-19 alloy bars that bind 9 painted red, while the stern selected 140/90-16 size monoblock alloy circular. This classic impression diperkental single seater with seats made of leather underneath there is a spring that still comfortably occupied. Ignition improved with the installation of Screamin Eagle HD is part levers. Of course, wildness must be controlled machines, including stopping speed. Thus, broad disc diameter discs with multi-piston KALIPER believed to mengawalnya.Modifikasi is not different from other HD modif highlight nuances of chrome and black cast, thus giving the impression macho. "It's more challenging when building their own motorcycle. Is where his art has a motorcycle chopper" lid.